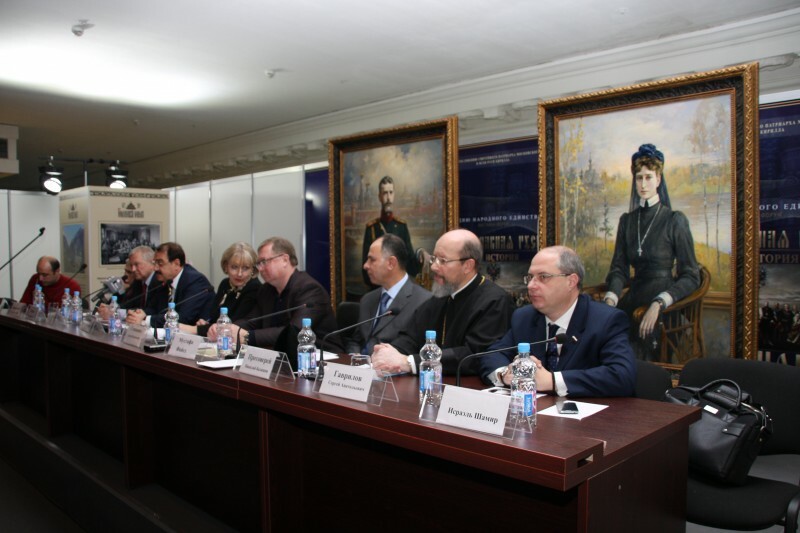 On November 5, 2013, a round table on “The situation of Christians: new threats and the humanitarian missions of the Imperial Orthodox Palestinian Society” was held in Moscow as part of the 12th church-public exhibition-forum “Orthodox Rus’ – Towards the Day of People’s Unity”. It was organized by the IOPS Moscow branch. It was attended by the IOPS leaders, ambassadors of the State of Palestine and Syria, Russian ambassadors, Foreign Ministry officials, State Duma deputies, and professors and students of the Faculty of Orthodox Culture of the Peter the Great Strategic Army Academy. The Russian Orthodox Church was represented by Archpriest Nikolay Balashov, vice-chairman of the Moscow Patriarchate’s department for external church relations. Addressing the meeting Mr. S. Stepashin, IOPS chairman, reminded the participants that Russia was long seen in the Arab world as a country which comes with humanitarian mission. Among the tasks of the IOPS is to promote this mission in the present situation and to give humanitarian aid to people in hot spots, especially in Syria. “One of the serious problems today is the situation of civilians in the Middle East, especially in the places swept by the so-called Arab Spring that actually has rather led to winter”, he said, stressing the importance of the efforts made by the state leaders and Russian diplomats to prevent active military actions against Syria. He also spoke about the efforts for preserving Christianity in the Middle East. These efforts, he said, were not only slogans but our reaction to this serious threat. With the blessing of Patriarch Kirill and by the agreement with the president of the country and with active support from the Ministries of Foreign Affairs and Emergencies, the IOPS has given considerable humanitarian aid to the suffering people in Syria, regardless of their religious or ethnic background, Mr. Stepashin said. He informed the round table about the work the IOPS carried out in the Middle East and North Africa to protect Christians in the Middle East and North Africa in active cooperation with Christian communities there. “Our today’s conference is not simply an exchange of opinions, it is the exposition of our stand and plan of concrete actions assumed by the IOPS”, he noted. In his remarks, Mr. Riad Haddad, Syrian ambassador to Russia, thanked the IOPS for the humanitarian aid it gave to the Syrian people. He expressed special thanks to Patriarch Kirill for “giving great attention to the Syrian problem”. He also spoke about the suffering inflicted on his people by international terrorists fighting in Syria, the defilement of people’s shrines, the destruction of churches and numerous killings of Christians. He said the terror threatened all – Christians and Muslims, endangering the peaceful coexistence of religions. To settle the Syrian problem, he said, it was necessary to reject the policy of double standards on the international level. Mr. Mustafa Fayed, Palestinian ambassador to Russia, spoke about the situation of the Christian population in Palestine. “Christians have always been an integral part of the Palestinian society and played a great role in the development of our people’s culture”, he said stressing with profound regret that at present the number of the Christian population in Palestine was decreasing. “Our people and our leaders devote much attention to the enlargement of the Christian presence in our land”, he said. The Palestinian ambassador thanked the Russian Orthodox Church and the Imperial Orthodox Palestinian Society for their assistance in preserving and extending the presence of Christianity in Palestine. Archpriest Nikolay Balashov spoke about the grave situation in which Christians found themselves in Syria. “Every day we receive new reports about tragic events linked with the persecution to which our fellow-Christians are subjected in Syria. Half a million of Christians have already become refugees. Tens of churches and monasteries have been destroyed. There are clergy killed. Two prominent Christian hierarchs in Syria have been in captivity for half a year now, and we have no reliable information about their whereabouts and the demands that could be made by their abductors”, he said. The situation of Christians in a number of other countries in the Middle East remains grave. Hundreds of thousands of them have had to flee Iraq after “democracy began to be implanted” there through the efforts of the USA, whereas these people had been safe in pre-war Iraq. In Libya, after an operation to implant democracy was carried out there, the Christian population is asked to leave the country actually by the state authorities now. The situation of Christians in Egypt becomes ever more vulnerable from day to day, and they have to leave for other places, with some seeking asylum in Russia. As Father Nikolay noted, this situation affects Christians in other countries of the Middle East as well. “The Russian Orthodox Church speaks about it at every international forum where possible including the General Assembly of the World Council of Churches which is taking place today in South Korean Busan”, he stated. He also reminded the meeting that this year all the dioceses, parishes and monasteries of the Russian Church conducted a fund-raising campaign for aid to victims of the armed conflict in Syria. Over 1,3 million dollars were collected. “This money, which our parishioners left after divine services, is a manifestation of our people’s solidarity with the suffering people of Syria. The raised funds were handed over to our sister Orthodox Church of Antioch for purchasing the necessities for refugees and distributing aid”. As a member of the IOPS, Father Nikolay noted that the society already supplied some seven humanitarian aid cargos to Syria. The aid is divided between the two leaders of religious communities in that country, with one half distributed through the Supreme Mufti of Syria and another half through the Orthodox Patriarchate of Antioch. Speaking about real mechanisms of supporting Christians and preventing their increasing persecution in the world today, Archpriest Nikolay Balashov recalled that the European Parliament adopted in 2011 a resolution whereby any aid, either economic or political or financial, to a country in which the rights of Christians are violated should be exchanged for guarantees of safety for the Christian population. “It is an excellent resolution but we have not seen its implementation to this day”, he said, “I think we should see to it that the adopted decisions should be implemented. It is important to draw the attention of the world public opinion to the tragedy of the destruction of Christianity in the lands of its origin. Unfortunately, most of the world mass media keep silent about this problem as if it does not exist”. In conclusion of the meeting, Mr. Stepashin proposed that the round table as part of the Orthodox Rus’ – Towards the Day of the People’s Unity exhibition-forum become a regular platform for discussing the protection of Christian in various parts of the world.